Almost everyone is familiar with the term “child support” and most people understand it as a term that refers to a parent that does not have custody paying the other parent that has custody of the child. The truth is, however, that child support is actually a bit more than just that. If there is a third party caring for the child, then both parents can be held responsible for paying child support. The court will follow standards determined by the state to consider a variety of things in order to determine if someone should pay, and if so, how much. Whatever the case, the sole purpose of this payment is simply to ensure that the child is taken care of. Child support is not something to punish either parent. It helps ensure that the children get adequate care to help them grow into well-balanced individuals that are contributing members of society. Also, parents should know that child support DOES NOT automatically give a parent visitation or custody of any kind. Ultimately, the non-custodial parent would have to go through a separate legal action to even challenge the custodial parent for custody. The responsibility for the child used to rest solely on the parents. However, past unfortunate events between parents that have split up have made it necessary for child support enforcement by state agencies to get involved. By working with the family court to establish a child support withholding order, the agencies can require payment to be automatically deducted from the non-custodial parent’s paycheck. It is in the best interest of the parents to seek guidance from an experienced child support attorney. 1. Fill out the necessary forms at the Probate and Family Court or online. The correct forms will depend on your marital status and if the other parent refuses to claim their paternity. If paternity is an issue, then you will need to file these in the county where the child currently resides. Make sure you take proof of address, birth certificate (with both parents’ names on it) and contact info of the parent it is being filed against. If court costs are an issue, you can apply for an Affidavit of Indigency to waive the costs. It is important that you know that this will NOT provide a lawyer in this case, so it is up to you to hire and pay a lawyer on your own. A lawyer can ultimately help you protect your child and they can save you money in the long run, too. For these reasons, it is highly recommended that you seriously consider hiring a lawyer if it is at all possible. 2. Receive your “Domestic Relations Summons.” It will have the date that is the deadline for the other parent to respond. The court can make a decision about child support whether or not the other parent chooses to come to court. If your Affidavit of Indigency was approved, the sheriff or constable will be returning your papers with a “Proof of Service” to let you know that the other parent has received the summons. 3. Complete the Domestic Relations Summons and return it to the court clerk for a “return of service.” It is highly recommended that you make a copy of the original summons to keep in your records. 4. You may need to file a “Motion for Temporary Support Order” in order to get temporary support from the other parent. If that is the case, you will have to schedule a court date with the county clerk and serve the other parent with a copy of the motion telling them the time, date, and location of the hearing. This could help with financial support until your original complaint is heard. 5. Complete a Financial Statement to the court. 6. Attend the hearing as scheduled. *You can file for child support at the same time as a restraining order if necessary, and it could help speed up the process. Some states allow this to be filed in other courts instead of just the Probate and Family Court. There is no federal law that governs the calculation of child support, so instead, each state relies on their own civil statutes. Every state relies on one of the following models. As mentioned previously, child support is determined differently in each state. However, each state will use at least one of the following models. Keep in mind that sometimes the court will still choose to deviate from any one of these models regardless of the state standard, so predictions on what a parent will pay cannot be ironclad. The amount could be increased or it could be lowered. Where the payment is based on each parent’s income and the number of children. Where the payment is based on a determined percentage from the gross or net income of what the non-custodial parent is making. The number of children is also considered. Where the payment is based on certain factors that include a standard of living adjustment (SOLA) and the needs of the child. If the child’s parents live in different states, the non-custodial parent is still required to pay to support the child. The Uniform Interstate Family Support Act (UIFSA) is a federal law that every state follows, and it deems the controlling state as the one capable of any child support modifications. Parents with this concern need to reach out to their local child support agency. Depending on which state will be the Continuous Exclusive Jurisdiction (CEJ), the matter could be resolved locally with them, or they might refer your case to the new state. Keep in mind that although the process can take as little as 6 months, it can also take over 9 months. If there has to be a hearing, then it is likely to take a bit longer. If a biological parent of a child refuses to accept responsibility, or if there is any reason to question who the father could be, then the custodial parent will have to get legal proof. Unfortunately, if the parent refuses to take the genetic (DNA) test, then a lawsuit has to be filed against them in order to get the test completed. It can be a costly endeavor. No matter which method you choose, you can expect to spend around $300 to $500 for a legal test. Be careful about what paternity you use in this case. It is vital that it be able to stand up in court. Some tests are cheaper than others, but they are not all reliable! You want a legal paternity test, so make sure it is AABB accredited. Your sample needs to be collected in a lab or hospital and there is certain documentation required. After you submit your samples, you should get your answer within 2-3 days. It is possible to expedite the results to get them even sooner. If the parent in question refuses a court-ordered paternity test, they can be charged with contempt of court and be required to pay a fine or face criminal charges. * It is very important to have the father’s name on the BIRTH CERTIFICATE, because if not, then not only is he given no rights to custody or visitation, but he is also not liable for child support. Child support is an important matter, and should never be disregarded. If the non-custodial parent is not paying the amount that they are required to, they could face serious actions. 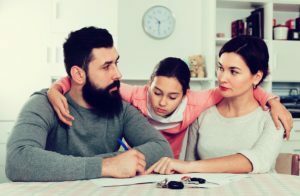 If you have been delinquent with your payments (the legal term is “arrearage”) and want to try to get on track, know that it is possible in some states to have child support debt forgiven, but there is often eligibility criteria that must be met. Take care of this as soon as possible, because the court can even charge interest on the support you still owe. Furthermore, if you end up over two years late with your child support payments or if you owe over $10,000, you will have committed a felony and be facing fines and prison. Speak with a bankruptcy attorney for help with this. The person that opened the case with the Department of Child Support Services (DCSS) is able to close it. Understand that the closed case could still conflict with a court ordered obligation to pay child support. There is no longer a child support order and not at least $500 that is still owed. If there is no enforceable levy on their estate. Child support has many ins and outs, so be sure that you do what it takes to get the qualified legal guidance and representation that you need. No matter what, this is a crucial time for any children involved, and their future needs the best care possible. Find a child support lawyer in your area now.